What the Eagles did: I’ve already written about the Nick Foles pick at some length here, although only from the perspective that I think he was overdrafted based on his talent. Foles is an odd selection because he seems so far outside the type of player Andy Reid usually goes for. Huge, with a cannon arm but limited athleticism doesn’t exactly echo through the years of Donovan McNabb, Kevin Kolb, and Michael Vick. It remains to be seen if Reid and Marty Mornhinweg can either fit him into their offense or adjust the offense to fit him. Maybe I’m reading too much into his press conference, but my immediate thought after watching it was along the lines of, “that was a much stronger endorsement than Reid gave Foles.” And Wilson just makes so much sense as a player who wouldn’t challenge Vick’s current leadership but could learn a tremendous amount watching him. Given Wilson was selected only 13 spots ahead of the Eagles by a Seattle team that no one expected to draft another quarterback, Reid and Howie Roseman may have been forced to settle for Foles instead. What I would have done: Obviously, I wouldn’t have drafted Nick Foles. He doesn’t seem likely to have the talent or the fit to make him a potential starter down the road, nor will he help push Mike Kafka to be a better backup. 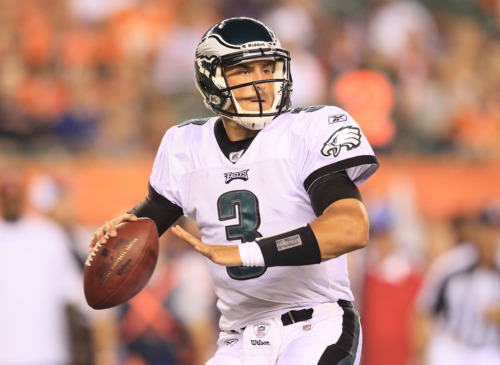 The Eagles definitely have a long term need for a franchise quarterback to replace Vick. We won’t know how long term that need is until after this coming make-or-break season for him. Therefore, barring the ability to go get a top talent like Robert Griffin III, drafting someone in the early-middle rounds probably wasn’t the best use of resources. My goal would have been to grab a veteran backup to compete with Kafka instead, perhaps buying low on either Colt McCoy or Seneca Wallace in Cleveland. Way-too-early prediction: Don’t expect anything from Foles this year, but it will be interesting to see if the Eagles quarterback gurus can help Vick and Kafka rebound from a down year in 2011. As a rule of thumb, one shouldn’t discount the Eagles coaching ability in this area (Vince Young/Mike McMahon nonwithstanding), so I’m reasonably optimistic. Still, I wonder if we’ve seen the the limits of Vick’s abilities. It’s tough for him to mature into a more responsible quarterback at his age. An improvement from last season is likely, but a return to 2010 may be too much to ask. As to Kafka, I don’t trust him right now but a third-year leap into AJ Feeley territory isn’t out of range. Oh, and Trent Edwards is not making the team. Tagged with Philadelphia Eagles, NFL, NFL Draft, Quarterback, Nick Foles, Mike Kafka, Michael Vick, Andy Reid, Marty Mornhinweg, AJ Feeley, Russell Wilson, Colt McCoy, Seneca Wallace, Backup, Free Agency, Trade, Trent Edwards. May 3, 2012 by Brian Solomon.